Everyone hopes to have a few friendships that last a very long time. These are very special friendships. In this section you will find some stories of different kinds of friendships that are lasting. This includes romantic friendships that lead to marriage or where the friends decide to stay single but committed. It also includes friendships where friends share strong, lasting bonds. Joanne and Allan used to work together. They fell in love and they wanted to get married. Friends helped them think about how they could manage together. After talking to a counsellor several times, they decided they would go ahead. They have been happy together now for a long time. They made some important decisions before they got married. 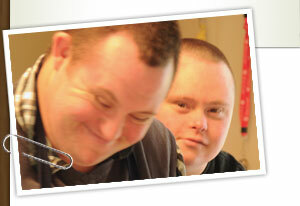 They knew they would not have much money, so they asked a support worker to help them with their budget. They decided not to have children. It would be enough to look after themselves and each other. Some lasting friendships are between friends of the same age. Some are between friends of different ages. Age does not matter. Lasting friends may be friends with whom we share a history or family connections. They may be friends we made through a shared interest or a group that we belong to. Friendships can last even when one friend moves away. The friendship lasts because both friends make an effort. They find ways to stay in touch. They keep each other up to date about their lives, even if they only see each other every few years. What makes a friendship last a long time? When we first make a friend we don’t know if the friendship will last. BUT we can make a decision to try to make it last by being the best friend we can to the other person. All these qualities grow over time. In any lasting friendship both forgiveness and celebration are needed. If a friendship is to last, the friends need to know how to forgive each other and to celebrate together. As in all good friendships, the friends are interested in each other’s lives and they show kindness and thoughtfulness to each other. Each good friendship has something that is different from other friendships. One person told us: We get along really well. We share a lot of things I wouldn’t share with my sister. Another commented: I really like this person and it doesn’t matter how much time has passed between seeing each other, he always recognizes me and he doesn’t hesitate to show that he is glad to see me. Some lifelong friendships start out with one person helping the other. Beth used to help Mike with things like laundry and cooking. Soon, she realized that Mike helped her a lot too. He made her feel welcome. She could be herself with Mike. Beth and Mike have different interests and hobbies. But over the years, they have shared many fun experiences and adventures. They have a deep bond of friendship. Mike knows that Beth cares about him and is committed to him. Beth knows that Mike cares about her. They have been friends for 30 years. Marriage calls for careful thought and planning: The story about Joanne and Allan is about two friends who met as young adults and decided they wanted to get married. If you are thinking about getting married, knowing more about their story may help you have a successful marriage, like theirs. In Summary: Marriage can be a very happy and successful experience for people who love each other deeply and who have a disability. Joanne and Allan’s long marriage shows this. But marriage is never easy. If you have a disability there will be many additional challenges. Sometimes people think they want to get married but when they think some more, they change their minds. That is okay too. Below is a document that talks about some of the things Joanne and Allan did to prepare for marriage.